For decades, textile work barely figured in discussions and studies of modern art because textiles have historically been linked to women’s work, domesticity and what could be called a “feminine sensitivity”. However, contrary to the traditional image of textiles as rooted in diligent care, intimacy, and intuition, textile practices are logical and iterated operations, structural processes produced through mechanical and engineering decisions, much more than affective expressions of homely pragmatism. Their recognition as an art form only really occurred at the end of the 1990s with the emergence of the network as a major contemporary figure and the increasing attention given to the way in which algorithmic processes shape our contemporary condition, as well as from a revival of interest in craft and design which gave textiles a new significance, releasing them from the margins of modernity. 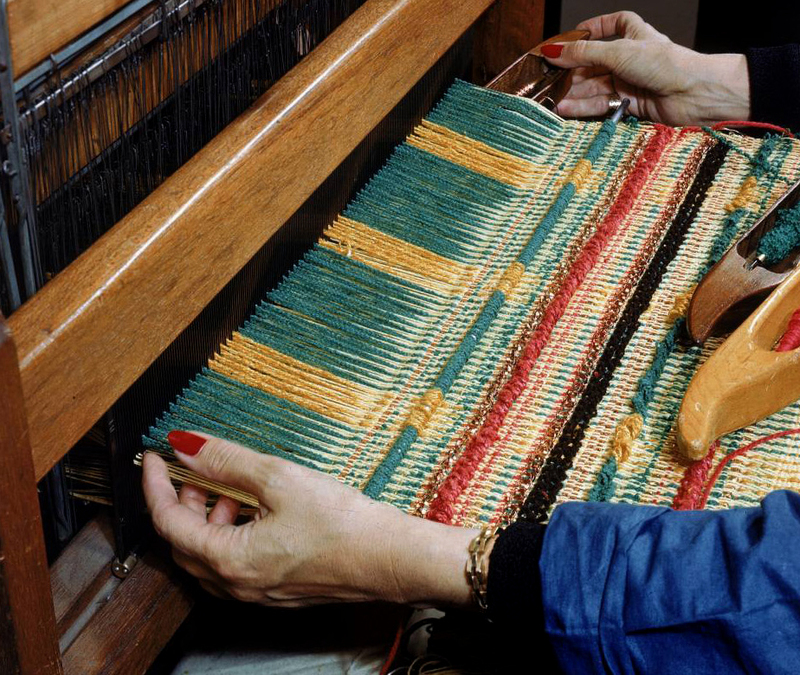 Because of their common genealogies and operations, the interaction between developments in computing and textiles opened new fields of research between textile experimentations and digital technologies. We invited T’ai Smith to discuss how textile practices can both reorient our understanding of the modern project and, as a rule-based art, help provide direction to the artefactual elaboration of its future. Glass Bead: In your book Bauhaus Weaving Theory: From Feminine Craft to Mode of Design (2014), you investigated the weaving workshop’s history, highlighted its central position within the school, and positioned it as a major theoretical engine for the modern project at large. A fundamental shift in textile works of the early 20th century is their progressive uprooting from questions of representation (adequation to references) towards questions of construction (production through inferences). This is a movement that you trace back, in your book, from the early “pictures made of wool” defined by Günta Stölz, one of the leading figures of the workshop, to the invention of a specificity of the medium through the writings of the women of the weaving workshop. Can you tell us more about this shift and how its impact may open to an alternative (or a diagonal) history of art? T’ai Smith: I would agree with the use of the term ‘diagonal.’ It goes far to describe the history of 20th-century European textiles—one that doesn’t just parallel (“an alternate”), but also cuts across more mainstream histories of modernism in that they occasionally collide, produce sparks, and then part ways. I gather what you might be getting at is the way that the Bauhaus weaving workshop’s material and theoretical movement away from pictorial references toward procedural, functional, and material concerns in some sense diverts the trajectory of abstraction that comes through the French and Russian contexts, which is primarily visual-pictorial. What is fascinating about the case of textiles at this particular moment is that the modernist genealogy of form gets complicated. Like many modernists and several of the Bauhaus faculty (I am thinking of Johannes Itten and Paul Klee), the weavers were initially swayed by the colonialist language of primitivism. As much as they were looking at their contemporaries in Europe (cubists, expressionists, constructivists), they were also examining and appropriating formal patterns and structures from non-European and indigenous cultures. Their exposure to collections of South American textiles at the Ethnological Museum of Berlin meant they acquired an understanding of the more expansive time and geographical reach of their medium. I suspect what they learned from working with threads and looms while looking at ancient blankets was that the history of visual art is spatially and temporally complex—more like the superposition of waves than a single line toward abstraction. Any model of progressive uprooting was also a reverberation of the past. Indeed, a study of the Bauhaus weaving workshop does two things to remap the method of historical analysis. It requires an examination of the ways in which different patterns and concepts—at once modernist, medieval, and ancient, Western and non-Western, discursive and non-discursive—collide through ebbs and flows. In this site, forms, politics, and rhetorical gestures overlap like omnidirectional pulse waves. To make a more general statement about what this does for a model of art history, it might be instructive to compare this to the way that Mesoamerican art historian George Kubler articulates movement and transformation in The Shape of Time.1 Against teleological and biological models of history, he makes the case that styles and forms produce divergent (and sometimes mutant) signals across space and time, comparable to the travel of light waves from stars, in ways that are not always intelligible. But Kubler’s method loses out in its nonconfrontation with discourses and institutions. Kubler’s approach accounts for the ways signals generated by visual forms become distorted by a kind of parallax. But these signals are barely mediated, in his account, by textual-linguistic frames. Modern art history is definitely an instance where we cannot avoid the discursive; the rhetoric of the manifesto within avant-garde and abstract art is inseparable from the work. For example, Malevich’s Black Square is tethered to his textual language of the “zero” of art. Thus, the shift from representation (or “adequation to references”) to “construction” is at once a condition of rupture and repetition, modernity and something transhistorical, materially (or ontically) and discursively generated. GB: One of the central questions of modernity has been the relation between a figure and its ground. This dialectic was constructed throughout modernity through the articulation, distinction or fusion of the figure/motif and its background, but works in textiles have a different logic, operating through a topological perspective that totally transforms the terms and their space of inscription. The weaving gesture produces at the same time the pattern and its canvas. In weaving practices, there are no clear partitions but a new logic of relations: vectors and dynamic polarities. It is also a geometrization of power relations that is at stake here, at all scales—from the very fiber of the threads to the organization of the Bauhaus workshop. The consequences of this textile topology can be very far-reaching for art history. Second, and quite importantly, by focusing on the activities of a workshop, I was able to shift methodologically from a focus on the literal, monographic figure (the modernist artist) to the community of practitioners and the mode of production. Art history of the modern period is very tied to the biographic identification of artists, which is unfortunate, as it leaves so much out of the discussion. Coming at this project through the lessons of Cultural Studies, I was no longer able to abide the monographic model. Indeed, my method was formed out of a political impetus (a feminist and Marxist worldview), but it was also the case that the Bauhaus, by nature of the community and the ideal of (corporate) anonymity, was suspended in the contradiction between makers making and artists being. When I chose to pursue the topic, I loved that there was no way to avoid the conflicts and collisions between the collective and the individual, and that the dynamics of these tensions were necessarily apparent in the workings of the workshop. For instance, by stressing that the weaving medium had experienced a particular “feminization” (Verweiblichung) within modernity—that this medium, over the course of the long 19th century, turned from a (medieval) craft led by male masters (individuals) to an industrialized practice undertaken by hordes of anonymous, female bodies—I was able to decenter the role of gendered identities (particular “women”) and refocus the examination on the history of practices and institutions. By foregrounding the collective ground, I aimed to show how different agencies (specific weavers) came into that space and absorbed collectively generated lessons but also created new dynamics and vectors. In one essay (not in the book), I described this as a gravitational meeting and collision of atoms—riffing off of Jean-Luc Nancy’s discussion of the inoperative community as a clinamen.2 The case of the weaving workshop made it especially evident that this site of modernism was a complex network of agencies and discourses. That said, it is important to understand that the parameters and organization of the weaving workshop, however nonhierarchical in practice, were also pushed up against several institutions with their own bureaucracies and logics: Bauhaus governance, State bureaucracy and political parties, the history of gender, etcetera, which were not all homologous to one another, either. The network of the workshop and the school (with its different nodes, vectors, and hinges) was striated by multiple hierarchies and competing protocols that helped mediate how those relations (vectors—not all the same length and not neutral) were navigated and played out. Indeed, the question of gender and its relation to the institution is paramount. The fact that the medium was gendered ‘feminine,’ and placed in a hierarchy of mediums, allowed the weavers a certain flexibility. They navigated the power dynamics that circumscribed and penetrated the school by adapting their medium to the language of other media (painting, architecture, photography, patents) and by adapting to transitions among very unstable discourses. The weavers were very strategic and savvy, one might say. Hence, their textile practice was able to sit in the background relatively unnoticed, and this stealthy approach was crucial, I would argue, for the workshop’s longevity over the duration of the school’s history. GB: Modern textiles—as you expressed in your book on the Bauhaus, and made explicit above—defined themselves with and against other conventional media such as painting. One of the major differences is that textile is a rule-based art. To create a pattern means to elaborate a set of rules, and a new pattern appears with a change within the rule. Contrary to painting—i.e. traces that you produce on a canvas—a line, in a woven work, is a gradual change of rules. While painting plays with a notion of presence (expression and articulation), textile seems to have more to do with questions of information (compression and convertibility). You are currently working on a new book on diagrams and sewing patterns, and this question of information—under the form of notation (a code)—seems highly relevant for an art that relies on a formal language. How do you see the relationship between patterns and rules in textile work? TS: Insofar as weaving reproduces a binary logic (the alternate interlacing of warp and weft threads), woven patterns and structures are essentially manipulations of algebraic equations. This was clearly demonstrated by an American weaver and mathematician, Ada Dietz, who exploited this principle in the 1940s and published a short treatise on it in 1949.3 Dietz basically devised threading patterns based on cubic binomial expansions (interestingly, her ideas for patterns were adapted by a computer scientist, Ralph Griswold for terminal screens in the 1980s). It is not so difficult to imagine, then, that the rule and the change in rule could become a code, a method for communicating through the manipulation and deciphering of slight changes in the pattern. The textile rule-pattern strangely came to mind recently while visiting the island of Crete, where I had the chance to see ancient Minoan artifacts in the Heraklion Archaeological Museum. Looking at the vitrines filled with pots, architectural models, stone tools, and various impressions of linguistic scripts (but no textiles, which were absent from the display because of material degradation), I had the uncanny feeling that I was looking at the products of Bauhaus workshops: the patterns of lines and waves found painted on pots and cups were repeated across similarly repeated models (even when separated, at times, by one or two thousand years), and they were remarkably consistent, almost like proto-industrial made goods. The patterns were not gestural and uneven (expressive and individual), but rather consistently abstract (in fact, much in the same way that historians have gotten in the habit of describing the intersection of Fordist logic and modernist abstraction). Which is to say that the patterns repeated but also developed with slight changes to the rules. I left wondering, somewhat like Gottfried Semper, whether the rule-based forms of the textile had informed if not the visual style then the mode of repetition—the geometric rhythm of the connected spirals and grids that jumped across and linked the otherwise bounded shape of pots or the city plans. Semper argued (while Riegl famously disputed him through his theory of the Kunstwollen), that textiles are the Ur-art form, in that they established the model for binding and patterning that would be taken up in other arts, like pottery, metalwork, and architecture.4 I don’t myself believe such a direct explanation of origins, but it is nevertheless striking that textile media rules seem central to the emergence of so-called behavioral modernity—that is, the “suite of behavioral and cognitive traits that distinguishes current Homo sapiens from other anatomically modern humans, hominins, and primates,” including the development of organizational systems, rituals, abstract thinking and planning, and the ornamentation of bodies with patterns (like cloth). Of course, all kind of media and tools require repeated gestures; humans are able to communicate and thrive because we repeat the same words, syntaxes, structures, and gestures, and then figure out ways to make slight changes in the rules to create new meaning-forms. Yet, at the same time, the rule-pattern logic (the algorithm) that is necessary to follow produce a textile (or a text) is less important to other media. For instance, in pottery, stone carving, or painting, there is more room to depart from shape-defining rules. Though those media often depict patterns, they do not, in and of themselves, require adhering to a discrete pattern of practice. GB: In this issue of the journal, we are interested in understanding historically the ways in which the artifactual elaboration of mind has been co-opted by dominant forms of labor within the social and technological history of capitalism. Our focus is on the type of traction art can have on it, beyond contemporary art’s mere representation of its logic. The critical intervention of the historical avant-garde in the capitalist economy of production of objects can be seen as a critical modelization at the scale of the inner structure of the artwork, decomposing and recomposing it by replacing the terms of commodity fetishism (labor and capital) by semiotic and formal ones (like content and form, or background and figure, the central axes of the modernist reflection on the ontology of the artwork), and where commodity fetishism is critically performed in the form of “exhibition value.” What seems very strong in textile practices is that they have not only been a space for modelization but also a space of direct intervention (due to their links to industry) and may allow to rework this modelization. Given the specific technological and political history of textile in art, and its inscription in an often-neglected social history, how do you see textile practices playing in this picture of modernism and the avant-garde? TS: The history of textiles as techniques (or artifactual elaborations of mind) gives us a very clear example of what Marx termed formal subsumption, whereby an earlier technique is taken up by and routed through the mode and means of capitalism (first industrial, with the steam-powered loom and cotton mill, and then postindustrial, with things like arduinos and circuit boards). In fact, if I were to rewrite my book now, I might say it was due to the ease of its formal subsumption by capital that textiles were met with such skepticism and anxiety by expressionist painters who worked under the logic of romanticism. There is nothing essentially critical about the use of textiles or textile forms within art practice. They can occupy different spaces and adapt to new systems’ logics: some neoliberal and others more antagonistic to capitalism. Nevertheless, textiles are useful for a practice that seeks to make an intervention insofar as they can ‘lay low’ in the background (invisible) or emerge in different shapes. As I suggested earlier, there is something stealthy about the textile. Insofar as it can change shapes, use modern or ancient technologies, or adapt to new uses and means, the textile is not restricted by the wall or the square (like painting). It can occupy the realm of functional production (design), it can transmit colonized or obfuscated codes (based in indigenous traditions), it can be frivolous (fashion), or it can encase and soundproof an environment (wall-to-wall carpeting or wall-covering). GB: It seems there is a trans-quality of textile practices (transcultural, transtemporal, transdisciplinary), as weaving practices are at the same time rooted in traditional forms of labor (manual looms) and cutting-edge industries. If textile has been seen as a domestic work, it is also very much linked to a revolutionary history, from the luddites to the Canuts, and has been part of a larger history of workers struggles. A history of textile can be seen as parallel to another notion which is ‘abstraction’, both as being part of the history of labor (taking the Marxian and economic sense of abstraction) and that of art. A reworking of textile practices through questions of compression, convertibility, code, relational logic, etc. seems to offer a rational counter-model (as its core material is the matter of reason itself: norms, rules). Can you elaborate on the relations between textile and revolutionary struggles and its relations to abstraction? And could we speculate on another relationship to abstraction through a ‘textile history of art’? TS: Marx’s elaboration of economic abstraction vis-à-vis labor, material, and processes was definitely rooted in his observations of textile work and systems. It is especially telling that he provides the classic algebraic formula in the first chapter of Capital on the commodity using the example of “20 yards of linen” and “a coat” (ein Rock). And when he elaborates his understanding of abstract (or estranged) labor, he describes how the practices weaving (Weberei) and sewing (Schneiderei) become equivalent through the abstract wage system, whereby time = money. Of course, textile manufacture and machinery were especially central to the history of industrialization. Engels owned a textile factory, and labor movements were initially rooted in the textile sector (from the English Luddites in 1812 to the French Canuts in 1860). These material facts all likely informed Marx’s thinking. But it seems to me that the “trans-” quality of textiles (their simultaneous timelessness and timeliness) may have also been very useful in making his argument about the movement from specific to abstract labor, or from materiality to exchangeability. When he brings in the 20-yards-of-cloth-to-coat formula, it is reasonable to imagine a bolt of cloth actually being turned into a coat—that is, performing a transcoding through a real, material act (cutting and sewing), or migrating “mysteriously” (for the consumer of the commodity) between one form and another. It really depends on how one defines abstraction (even within Marxian economic analyses there several ways), but many of these pertain to textile forms and processes: mathematization, algorithmic procedures, codes and diagrams (weave drafts), which made textiles especially well-suited to the logic of capital. This understanding of capital-as-abstraction is at root a procedure of simplification and extraction (from materiality). But abstract forms can also hide under the radar of intelligibility; they can be crafty. Abstraction can be either/both politically reactionary and radical, visible and invisible. If nothing else, the history of textiles makes this apparent. As for speculating on their political efficacy, I would suggest paying attention to the ways that textile codes, procedures, and forms can, in different ways, capture, reveal, and render things communicable; but, at the same time, they can also obfuscate structures and processes or camouflage or cover and hide surfaces. Along these lines, I have always liked Gottfried Semper’s very simple (and seemingly contradictory) formulation of textile functions: “The only two objectives of any textile production are: a. the binding / b. the cover. Their formal meaning is universally valid. Contrasts within this meaning (everything enclosing, enveloping, covering appears as a unity, as a collective; everything binding as jointed, as a plurality).”5 To be able to create a “unity” and “plurality” simultaneously—by both “covering” and “binding”—seems like a great strategy for radical practices. GB: The metaphor of textile or of a fibered network is currently commonly used. If we take back the critical history and capacity of intervention of textiles, could we extend the textile logic to contemporary objects and political stakes that have, a priori, nothing to do with woven objects? Having in mind the common genealogy of textile and computation, could the textile logic be a tool to understand the recent developments of AI and computation? TS: You have cited two different textile logics: the network and the computation. The woven textile, I think, has a more computational logic in that it is binary and algorithmic: its arrangement of warp and weft essentially involves “arithmetical and non-arithmetical steps and follows a well-defined model.” The network (or net), by contrast, can be multipronged and multidirectional (with different-scaled vectors) hinged by materially distinct nodes (not fibers); or, it can be made out of a single thread that is knotted to itself. The network is seemingly more suited to thinking about neural activity. The logic of the woven textile, however, may be too rigid, too binaristic. I do not know much about current research in AI, but it strikes me that the flexibility of graph theory might be better suited to the kind of organically-grounded neural pathways that are continuously redefined and rerouted, or which can grow (and die) in multiple directions without affecting the overall structure. That said, Catherine Malabou’s work did a lot to convince me that neurons and brains are not so much pliable planes (flexible), or even netlike, as they are plastic—continuously able to morph6 (more than the textile “sieve [tapis] whose mesh will transmute from point to point,” which Deleuze cites as a model for the control society.7) To imagine that AI could ever approximate this level of plasticity is, no doubt, part of the task of scientists in that area, but it is also a bit frightening. When we get to that point of biomedia, perhaps the rule-pattern logic of the textile will seem to offer something fresh and radical, something more human. Interview conducted for Glass Bead by Ida Soulard, Vincent Normand and Fabien Giraud. All images come from Griswold, Ralph E. Design Inspirations from Multivariate Polynomials, Part 1, 7 pages. Posted September 13, 2001. George Kubler. The Shape of Time. New Haven: Yale University Press, 1962. Print. Jean-Luc Nancy. “The Inoperative Community.” The Inoperative Community. Ed. Peter Connor. Minneapolis: University of Minnesota Press, 1991. Print. Ada K. Dietz. Algebraic Expressions in Handwoven Textiles. Louisville, Kentucky: The Little Loomhouse, 1949. Print. Gottfried Semper. Style in the Technical and Tectonic Arts; or, Practical Aesthetics, 2 Vols. (1861/63). Trans. Harry Francis Mallgrave and Michael Robinson. Santa Monica: Getty Research Institute, 2004. Print. Gottfried Semper. “Prospectus: Style in the Technical and Tectonic Arts or Practical Aesthetics” (1859). Gottfried Semper: The Four Elements of Architecture and Other Writings. Trans. Harry Francis Mallgrave and Wolfgang Herrmann. Cambridge: Cambridge University Press, 1989. 175. Print. Catherine Malabou. What Should We Do with Our Brain? Trans. Sebastian Rand. New York: Fordham University Press, 2008. Print. Gilles Deleuze. “Postscript on the Societies of Control.” October 59 (Winter 1992): 3-7. Print. T’ai Smith is an art historian and Associate Professor in the Department of Art History, Visual Art and Theory at the University of British Columbia, Vancouver.